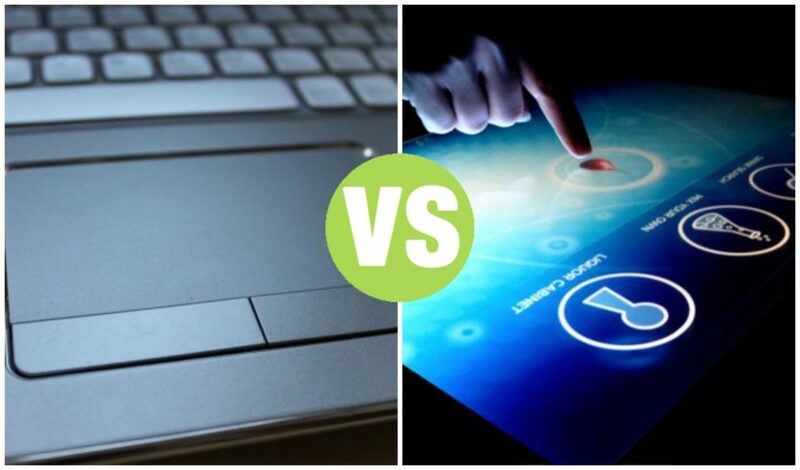 Summary: Difference Between Touchpad and Touchscreen is that touchpad is a small, flat, rectangular pointing device that is sensitive to pressure and motion. To move the pointer using a touchpad, slide your fingertip across the surface of the pad. While touch screen is a touch-sensitive display device. Touch screens that recognize multiple points of contact at the same time are known as multi-touch. Users can interact with touch screens by touching areas of the screen. A touch screen is a touch-sensitive display device. Touch screens that recognize multiple points of contact at the same time are known as multi-touch. Users can interact with touch screens by touching areas of the screen. Because touch screens require a lot of arm or hand movements, you do not enter large amounts of data using a touch screen. Instead, users touch words, pictures, numbers, letters, or locations identified on the screen. Some touch screens also respond to finger motions such as sliding your finger to drag an object or pinching your fingers to zoom in or out. The latest version of the Windows operating system provides increased support for computers with touch screens. Support for touch screens makes it easier for users to interact with the operating system. With some smart phones, portable media players, and other mobile devices, you can touch the screen to perform tasks such as dialing phone numbers, entering text, and making on-screen selections. Some handheld game consoles also have touch screens. A kiosk, which is a freestanding computer, usually includes a touch screen.